We are on the brink of a major disruption, which we think might be bigger than the industrial revolution. 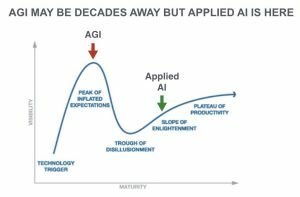 At BootstrapLabs we are focusing heavily on a major shift that is impacting almost every sector: Artificial Intelligence – AI. 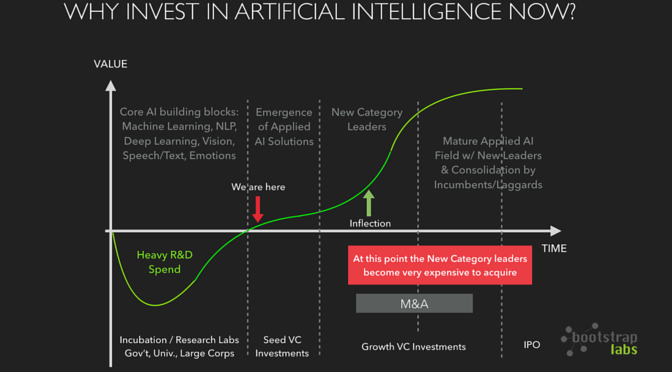 AI has reached an inflection point, where it can now be applied to quickly drive efficient returns, and in our book, is ripe for building startups that will disrupt major markets and their incumbents. During the Industrial Revolution, the steam engine enabled a major technological shift as a large amount of manual labor was now able to be automated. Yet, few know that the first version of the steam engine was actually built the 1st century CE and was called Aeolipile. It was not until much later, in 1712, when Thomas Newcomen developed a commercially viable version of the steam engine that applied to “mechanical work” that serious increases in productivity started to take place. 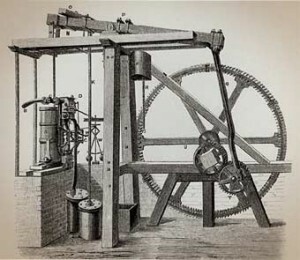 But, this major shift did not reach its full disruptive potential until 1781 when James Watt designed a model that provided a stronger and continuous rotary motion, resulting in an order of magnitude better output/cost ratio and allowed the technology to spread across applications and sectors, spurring the Industrial Revolution. As always with technology and its applications, it is a combination of factors that create an inflection point. The Garages of Silicon Valley: A similar pattern and iterative process emerged in the garages of Silicon Valley, and eventually spawned the likes of Apple, Hewlett Packard, etc. 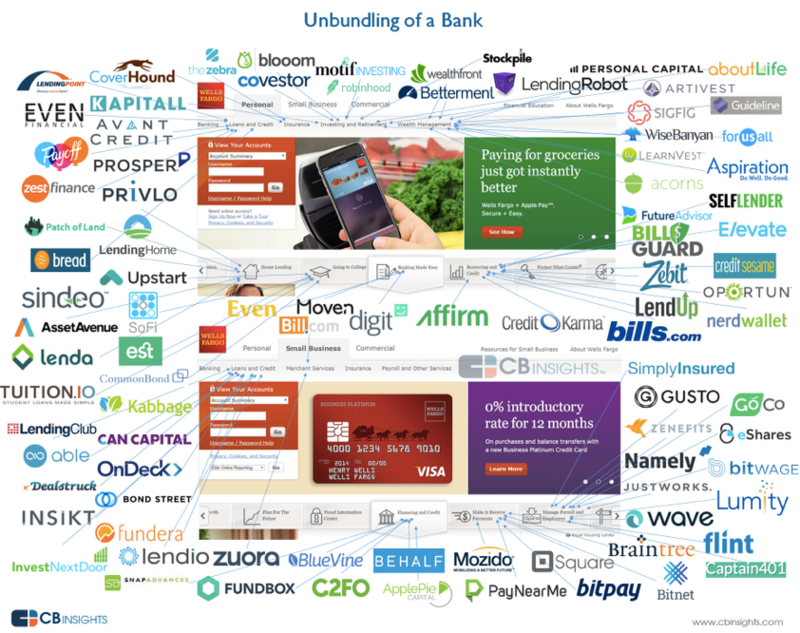 This is a recurring pattern of how innovation emerges. The inflection point is always triggered by a number of factors, not just the main innovation of the steam engine or the silicon-based CPU chips (or COTS components to build a computers for that matter). The Rear-Mirror Effect: These inflection points are often hard to spot. First there is disbelief, then some excitement. Then the general public tends to be disappointed by the slow(er) pace of adoption vs. their expectations, yet slowly but surely, additional improvements and iterations of the original breakthrough take place, quietly, unnoticed. Even additional breakthroughs building on the prior ones create an unstoppable wave of change that often catches people by surprise and most realize that the inflection point really happened a few year ago, when looking in the rear-mirror (and they are too late to the game). 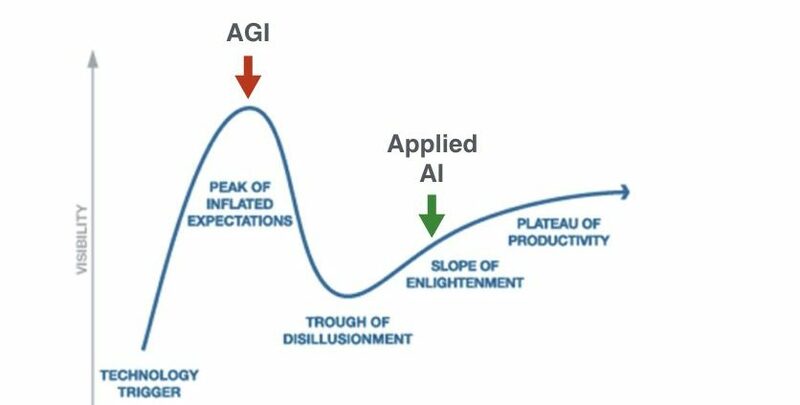 Today we have reached a similar inflection point with Applied AI and we believe it will have a significant disruption potential on many established industries, and our society at large. Today smart software can process massive amounts of data to derive knowledge and conclusions that humans simply cannot. 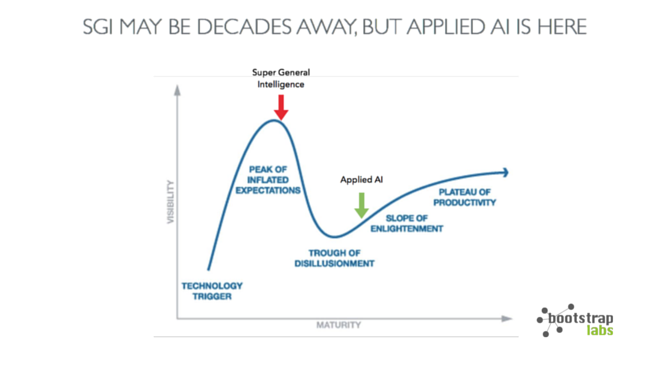 AI methods and algorithms are not new, they have been around for quite some time, but there are a number of factors that are creating an inflection point for AI to be applied in a much wider sense, across applications and industry verticals that were not feasible before. Additionally, more recent approaches and methodologies like deep learning have yielded an order of magnitude better results than prior approaches. We are buying twice the amount of CPU processing for each $1 every 18 months. We are buying twice the amount of storage for each $1 every 12 months. We are buying twice the amount of communications bandwidth for each $1 every 9 months. The vast majority of all information ever created by mankind was created, transferred, and stored in the past 18 months alone. 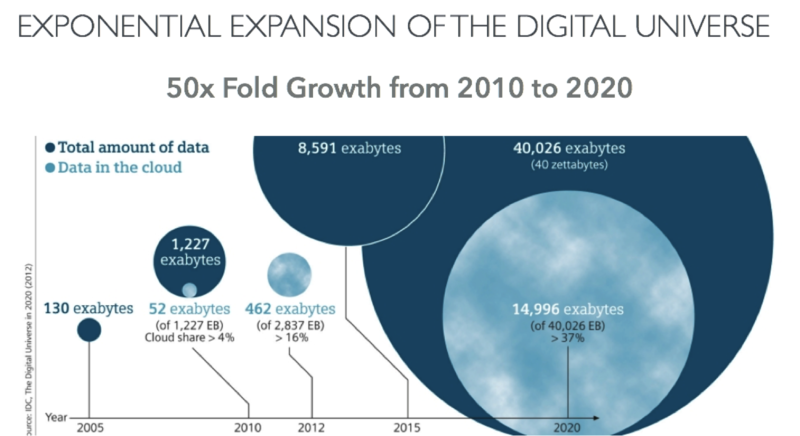 There is a massive amount of data (and knowledge/information to be extracted from it), and it is growing exponentially. Also multi-dimensional correlations add a massive opportunity. Take for example fitness trackers, such as JawBone and FitBit, that are tracking activities like movement and sleep. In just a few years they harvested more research data and conclusions (using machine learning) of how physical exercise and sleep are tied together than any research facility ever had in history (and at a fraction of the cost). Oh – and they also track where (geographic position) exercise is happening, which adds another dimension to this information. In another example, one of our portfolio founders is exploring how to connect your emotional state of being with what you read in your social communications channels, event calendar, etc., and have the machine learn and guide you on ways to improve your mental well being. The cost to build startups keeps going down, which is true for building AI at scale too, through hosted infrastructure, cost of hardware and open source software (backed by Google, Facebook, Yahoo!, OpenAI, etc.) AI is being applied right now in garages around the world where startups are being built. The hardware needed today is so commoditized that it is all more or less a software play (which increases the pace of innovation and efficiencies). 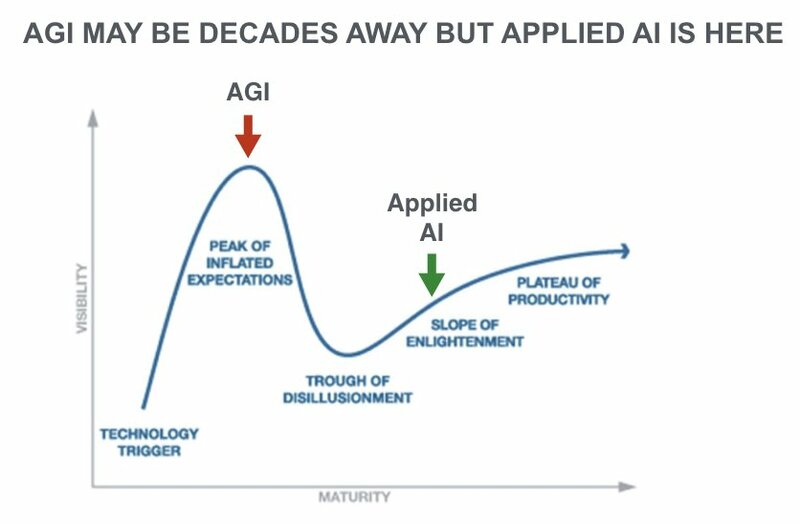 This all means that innovation by applying Artificial Intelligence is exploding and happening everywhere, not just in the large R&D labs and research facilities anymore. All this data, that can now be stored and computed cost efficiently using smart software (AI), holds answers to everything from optimizing your retirement savings, global economic flux, health, education, and answers of how to mitigate climate change today and tomorrow. AngelList uses massive amounts of data and interaction patterns with machine learning to improve matching and interaction in their global network of Angel investors. 23andMe uses machine learning and big data to find, in 20 minutes of compute time, the answers that took the CDC up to 7 years and a $100M study to accomplish. George Hotz, the San Francisco “hacker” known for being the first to unlock the iPhone, has built a self-driving car in a month, using mostly off the shelf components, and using deep learning methodologies, resulting in potential self-installation kits costing less than $1,000 a pop. JawBone has conducted the biggest sleep study in history (no company or research organization has had access to that much sleep data before). As with building any startup today, the hardest thing is Scalable Product Market Fit, which is also why it is so hard for incumbents to tackle the innovation that comes out of startups (Innovators Dilemma). The large and well funded R&D organizations are still good at cracking hard innovation with long time frames, often called “Moon Shots”, but much less so for finding new Scalable Product Market Fit. This is where startup innovation shines, and when the off the shelf components can be assembled quickly, innovation flourishes. There is an unbundling of the big corporations, and we think that the key disruption driver for the winners is going to be their ability to apply Artificial Intelligence, and build better, more efficient products that scale. So what are we doing about it at BootstrapLabs? We are, of course, focusing our entire Venture Building platform toward the discovery of the best Applied AI innovation globally, and empowering the founders behind them to build globally disruptive companies from Silicon Valley. We are vetting over a thousand startups per a year from Silicon Valley, Europe, and Asia, and are seeing some very exciting innovators (which you will read more about soon!) who are applying AI such as machine learning, image recognition, and deep learning. We are also bringing together the global AI community of hackers and builders at hackers.ai and hosting the biggest Applied AI focused conference in Silicon Valley on May 25th. Learn more about the Applied AI Conference 2017.
sound like do you know what you’re referring to!